Plan Melbourne is guided by the principle of 20-minute neighbourhoods. 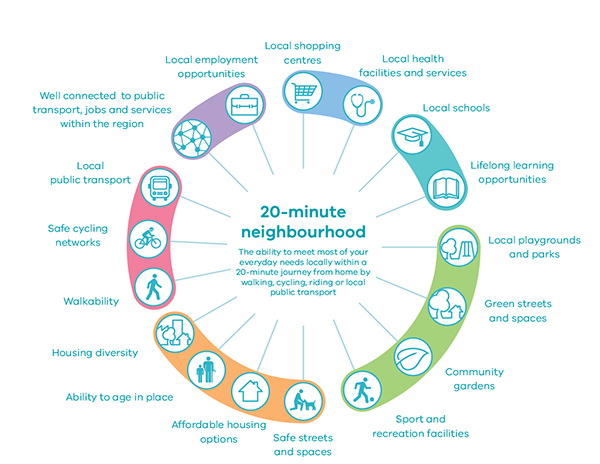 The 20-minute neighbourhood is all about 'living locally' - giving people the ability to meet most of their everyday needs within a 20-minute walk, cycle or local public transport trip of their home. Plan Melbourne's Five-Year Implementation Plan establishes actions to drive Melbourne as a city of inclusive, vibrant and healthy neighbourhoods. The Department of Environment, Land, Water and Planning (DELWP) is responsible for delivery of Action 75: Whole-of-government approach to 20-minute neighbourhoods. In January 2018 the Minister for Planning launched the 20-Minute Neighbourhood Pilot Program (the program). The purpose of the program is to test and evaluate the practical delivery of 20-minute neighbourhoods as part of a whole-of-government case study. The program is being delivered by DELWP in partnership with the Department of Transport (DoT), the Department of Health and Human Services (DHHS), the Victorian Planning Authority, local government, Victoria Walks, the Heart Foundation (Victoria), Resilient Melbourne, the private sector and communities. The key findings and learnings from the program will inform the development of guidance to support a whole-of-government approach to 20-minute neighbourhoods. Research undertaken by the Heart Foundation (Victoria) for the Victorian Government identifies hallmarks of a 20-minute neighbourhood. Strong and sustainable communities enjoy good access to local jobs, services, amenities, social infrastructure, and a rich social and cultural life. While the built form characteristics of individual neighbourhoods may vary, delivery of the following attributes will support people to live locally. They can also improve public health and well being, social cohesion, transport network efficiency and place-based design. Building pedestrian friendly neighbourhoods will help create a sustainable transport system by enabling short trips to be made walking. Plan Melbourne establishes clear direction to create an integrated local transport system that prioritises pedestrian movement in neighbourhoods. While cycling and local public transport provides people with active travel options, these modes do not extend neighbourhoods beyond pedestrian catchments of 800m. Pedestrian infrastructure, connections and streetscape design should be considered during the local planning process with priority given to pedestrians in neighbourhoods, particularly in activity centres. Neighbourhood activity centres are an integral part of community life and fundamental to the creation of 20-minute neighbourhoods. Local government has a role in supporting a network of neighbourhood activity centres. The planning of these activity centres should be coordinated through a collaborative community partnership approach. The Mixed Use Zone and Residential Growth Zone should be considered within 800m of neighbourhood activity centres. These zones can facilitate diverse housing and support mixed-use neighbourhoods at varying densities. Plan Melbourne's Five-Year Implementation Plan establishes actions to ensure Melbourne is a distinctive and liveable city with quality design and amenity. DELWP is responsible for the delivery of Action 52: Community Participation in Planning, which is critical to the principle of living locally 20-minute neighbourhoods. Action 52 seeks to create resilient communities by increasing community participation early in the planning and development of urban renewal precincts. Community participation and engagement can strengthen community resilience, increase knowledge and understanding of change, and empower local groups to be part of shaping the communities' future. To encourage community participation in planning, DELWP have partnered with Resilient Melbourne in Stage Two (2019) - Greenfield neighbourhoods. Brimbank, Maroondah and Moonee Valley City Councils delivered projects in Sunshine West, Croydon South and Strathmore from February-October 2018. The projects involved each council collaborating with communities to identify strategies to create more healthy, vibrant and inclusive neighbourhoods. In November 2018 the strategies were discussed at workshops with project partners. The workshops informed development of a Pedestrian Report and Planning Report for each neighbourhood. The strategies in both reports reflect the Heart Foundation's Healthy Active by Design guidelines and the relevant 20-minute neighbourhood attributes. A summary of the strategies will be released in 2019. Research projects in Mambourin and Beveridge North West will be led by Resilient Melbourne. The multi-disciplinary project will test 20-minute neighbourhoods in growth areas and showcase the benefits of community decision-making for greenfield developments. Social Infrastructure Report recommending stages for delivery of facilities and services in Mambourin. The projects commenced in January 2019. 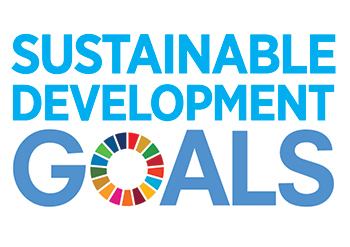 The 2030 Agenda for Sustainable Development established the United Nations Sustainable Development Goals for all 193-member states. To support a consistent approach to 20-minute neighbourhoods, a brochure has been prepared. The brochure contains information on the 20-Minute Neighbourhood Pilot Program, which is subject to ongoing research and evaluation. Further guidance on embedding the 20-minute neighbourhood concept into local planning schemes will be provided later in 2019. The following resources provide more information to help urban designers, planners, engineers and other place-making professionals who are seeking to create a city of 20-minute neighbourhoods. The Heart Foundation Healthy Active by Design guidelines provides tools and case studies to support the development of healthy neighbourhoods that promote walking, cycling and active public life. The Heart Foundation seeks to improve the build environment to support people to be healthy and more active in places they live, study, work and play. The resources are updated by collaborators at the National Health and Medical Research Council Centre for Research Excellence in Healthy Liveable Communities. Victoria Walks has an online information toolkit that professionals can use to promote walking and enable more walkable environments. In November 2018, Victoria Walks released the Economic Case for Investment in Walking in collaboration with ARUP. Victorian Integrated Survey of Travel and Activity 2016. Badawi, Y, Maclean, F, and Mason, B, (2018). The economic case for investment in walking, Victoria Walks, Melbourne. Gunn LD, King TL, Mavoa S, Lamb K, Giles-Corti B, Kavanagh A. Identifying destination distances that support walking trips in local neighborhoods. J Trans Health 2017. Gunn, L, Mavoa, S, Boulangé, C, Hooper, P, Kavanagh, A, Giles-Corti, B Designing healthy communities: creating evidence on metrics for built environment features associated with walkable neighbourhood activity centres. International Journal of Behavioral Nutrition & Physical Activity, 2017, 14:164.